Our world is rapidly becoming solid state. There are fewer and fewer moving parts. Calls, Letters, and daily goods are produced in the digital realm where the only moving is done by ones and zeros. The day of the mechanical and an understanding of how civilization arrived at today is rapidly vanishing. Three machines from the past are on display. These machines are obsolete and rarely used, if ever. Each machine is penetrated with an endoscope, a small camera used to see inside spaces where human eyes cannot see. 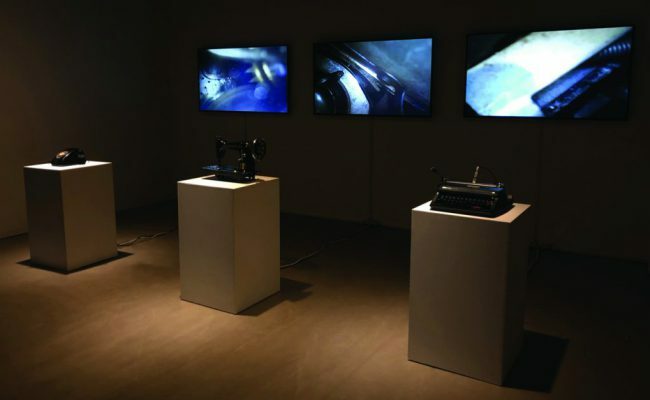 While the machines are operated by the viewer, each camera transmits the world inside each machine, revealing its working parts in motion as a projection. to work as well as a benchmark for where we are now. Each machine in itself is deserving of preservation as they mark a time we will never see again. It is what makes these machines operate that is a testament to how count- less engineers and inventors worked to bring our world into today.